Outlines of Mahayana Buddhism of Dr. Suzuki is one of the finest introductory manuals to date on Mahayana school of Buddhism. As an introductory essays, Dr. Suzuki has endeavored, within the limitations space, to be as comprehensive as is possible: Written in a style that is lucid, transparent and easy to read, the book sets out to present the most intricate and complex Mahayana philosophical doctrines in such a manner that an average reader can grasp them. In this noble mission the author has greatly succeeded. Daisetz Teitaro Suzuki was Professor of Buddhist Philosophy at the Otani University, Kyoto. He was probably the greatest authority on Buddhist Philosophy and Zen Buddhism. The terms "Mahayana" and "Hinayana" may sound unfamiliar to most of our readers, perhaps even to those who have devoted some time to the study of Buddhism. They have hitherto been induced to believe that there is but one form of Buddhism, and that there exists no such distinction as Mahayanism and Hinayanism. But, as a matter of fact, there are diverse schools in Buddhism just as in other religious systems. It is said that, within a few hundred years after the demise of Buddha, there were more than twenty different schools, all claiming to be the orthodox teaching of their master. These, however, seem to have vanished into insignificance one after another, when there arose a new school quite different in its general constitution from its predecessors, but far more important in its significance as a religious movement. This new school or rather system made itself so prominent in the mean time as to stand distinctly alone from all the other schools, which later became a class by itself. Essentially, it taught everything that was considered to be Buddhistic, but it was very comprehensive in its principle and method and scope. And, by reason of this, Buddhism was now split into two great systems, Mahayanism and Hinayanism, the latter indiscriminately including all the minor schools which preceded Mahayanism in their formal establishment. Broadly speaking, the difference between Mahayanism and Hinayanism is this: Mahayanism is more liberal and progressive, but in many respects too metaphysical and full of speculative thoughts that frequently reach a dazzling eminence: Hinayanism, on the other hand, is somewhat conservative and may be considered in many points to be a rationalistic ethical system simply. Mahayana literally means "great vehicle" and Hinayana "small or inferior vehicle," that is, of salvation. This distinction is recognized only by the followers of Mahayanism, because it was by them that the unwelcome title of Hinayanism was given to their rival brethren, - thinking that they were more progressive and had a more assimilating energy than the latter. 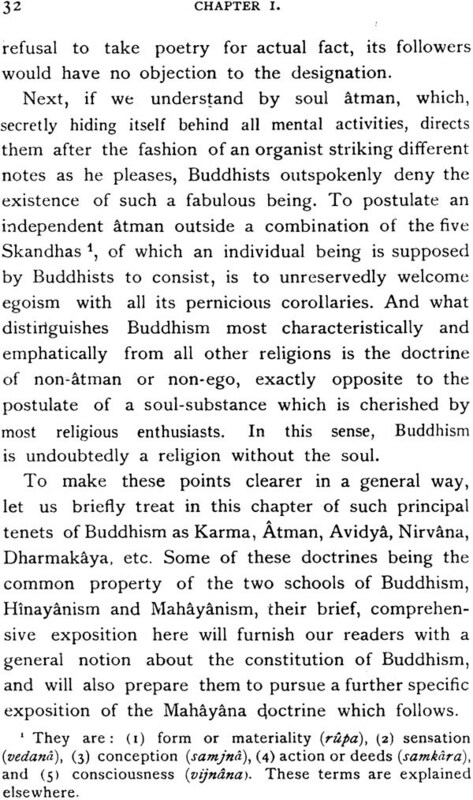 The adherents of Hinayanism, as a matter of course, refused to sanction the Mahayanist doctrine as the genuine teaching of Buddha, and insisted that there could not be any other Buddhism than their own, to them naturally the Mahayana system was a sort of heresy. Geographically, the progressive school of Buddhism found its supporters in Nepal, Tibet, China, Corea, and Japan, while the conservative school established itself in Ceylong, Siam and Burma. Hence the Mahayana and the Hinayana are also known respectively Northern and Southern Buddhism. En passant, let me remark that this distinction, however, is not quite correct, for we have some schools in China and Japan, whose equivalent or counterpart cannot be found in the so called Northern Buddhism, that is, Buddhism flourishing in Northern India. For instance, we do not have in Nepal or in Tibet anything like the Sukhavati sects of Japan or China. Of course, the general essential ideas of the Sukhavati philosophy are found in the sutra literature as well as in the writings of such authors as Acvaghosa, Asanga, and Nagarjuna. But those ideas were not developed and made into a new sect as they were in the East. Therefore, it may be more proper to divide Buddhism into three, instead of two, geographical sections: Southern, Northern, and Eastern. Why the two Doctrines ? In spite of this distinction, the two schools, Hinayanism and Mahayanism, are no more than two main issues of one original source, which was first discovered by Cakyamuni and as a matter of course; we find many common traits which are essential to both of them. The spirit that animated the innermost heart of Buddha is perceptible in Southern as well as in Northern Buddhism. The difference between them is not radical or qualitative as imagined by some. It is due, on the one hand, to a general unfolding of the religious consciousness and a constant broadening of the intellectual horizon, and, on the other hand, to the conservative efforts to literally preserve the monastic rules and traditions. Both schools started with the same spirit, pursuing the same course. But after a while one did not feel any necessity for broadening the spirit of the master and adhered to his words as literally as possible; whilst the other, actuated by a liberal and comprehensive spirit, has drawn nourishments from all available sources, in order to unfold the germs in the original system that were vigorous and generative. These diverse inclinations among primitive Buddhists naturally led to the dissension of Mahayanism and Hinayanism. We cannot here enter into any detailed accounts as to what external and internal forces were acting in the body of Buddhism to produce the Mahayana system, or as to how gradually it unfolded itself so as to absorb and assimilate all the discordant thoughts that came in contact with it. Suffice it to state and answer in general terms the question which is frequently asked by the uninitiated: "why did one Buddhism ever allow itself to be differentiated into two systems, which are apparently in contradiction in more than one point with each other ?" In other words, "How can there be two Buddhisms equally representing the true doctrine of the founder?" The reason is plain enough. The teachings of a great religious founder are as a rule very general, comprehensive, and many sided: and, therefore, there are great possibilities in them to allow various liberal interpretations by his disciples. And it is on this very account of comprehensiveness that enables followers of divers needs, characters, and trainings to satisfy their spiritual appetite universally and severally with the teachings of their master. This comprehensiveness, however, is not due to the intentional use by the leader of ambiguous terms, nor is it due to the obscurity and confusion of his own conceptions. The initiator of a movement, spiritual as well as intellectual, has no time to think out all its possible details and consequences. When the principle of the movement is understood by the contemporaries and the foundation of it is solidly laid down, his own part as initiator is accomplished; and the remainder can safely be left over to his successors. The latter will take up the work and carry it out in all its particulars, while making all necessary alterations and ameliorations according to circumstances. Therefore, the role to be played by the originator is necessarily indefinite and comprehensive. Kant, for instance, as promoter of German philosophy, has become the father of such diverse philosophical systems as Jacobi's Fichte's, Hegel's, Schopenhauer's etc., while each of them endeavored or indirectly stated by Kant himself. Jesus of Nazareth, as instigator of a revolutionary movement against Judaism, did not have any stereotyped theological doctrines, such as were established later by Christian doctors. The indefiniteness of his views was so apparent that it caused even among his personal disciples a sort of dissension, while a majority of his disciples cherished a visionary hope for the advent of a divine kingdom on earth. But those externalities which are doomed to pass, do not prevent the spirit of the movement once awakened by a great leader from growing more powerful and noble. The same thing can be said of the teachings of the Buddha. What he inspired in his followers was the spirit of that religious system which is now known as Buddhism. Guided by this spirit, his followers severally developed his teachings as required by their special needs and circumstances, finally giving birth to the distinction of Mahayanism and Hinayanism. The term Mahayana was first used to designate the highest principle, or being, or knowledge, of which the universe with all its sentient and non-sentient being is a manifestation and through which only they can attain final salvation. 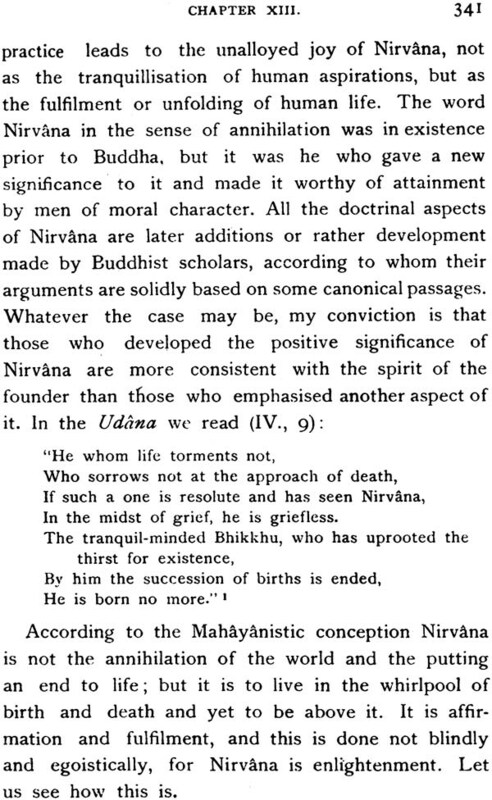 Mahayana was not the name given to any religious doctrine, nor had it anything to do with doctrinal controversy, through later it was so utilized by the progressive party. Acvaghosa, the first Mahayana expounder known to us, - living about the time of Christ, - used the term in his religio-philosophical book called Discourse on the Awakening of Faith in the Mahayana as synonymous with Bhutatathata or Dharmakaya, the highest principle of Mahayanism. He likened the recognition of and faith in, this highest being and principle into a conveyance which will carry us safely across the tempestuous ocean of birth and death to the eternal shore of Nirvana. Soon after him, however, the controversy between the two schools of Buddhism, conservative and progressionists as we might call them, became more and more pronounced; and when it reached its climax which was most probably in the times of Nagarjuna and Aryadeva, i.e., a few centries after Acvaghosa, the progressive party ingeniously invented the term Himayana in contrast to Mahayana, the latter having been adopted by them as the watchword of their own school. The Hinayanists and the Tirthakas then were sweepingly sondemned by the Mahayanists as inadequate to achieve a universal salvation of sentient beings. 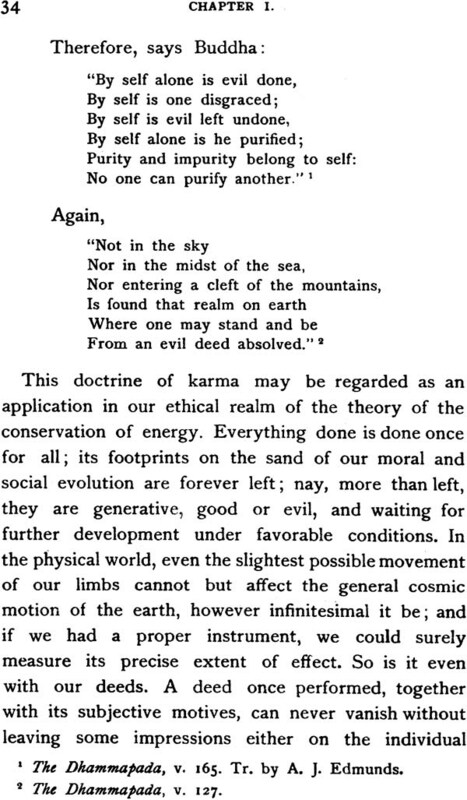 No God and No Soul - Karma - Avidya - Nonatman. -The non-atmanness of Things. - Dharma-kaya. - Nirvana. - Intellectual Tendency of Buddhism. Sthiramati's Conception of Mahayanism. - Seven Principal Features of Mahayanism. - Ten Essential Features of Mahayanism. Relation of Feeling and Intellect. 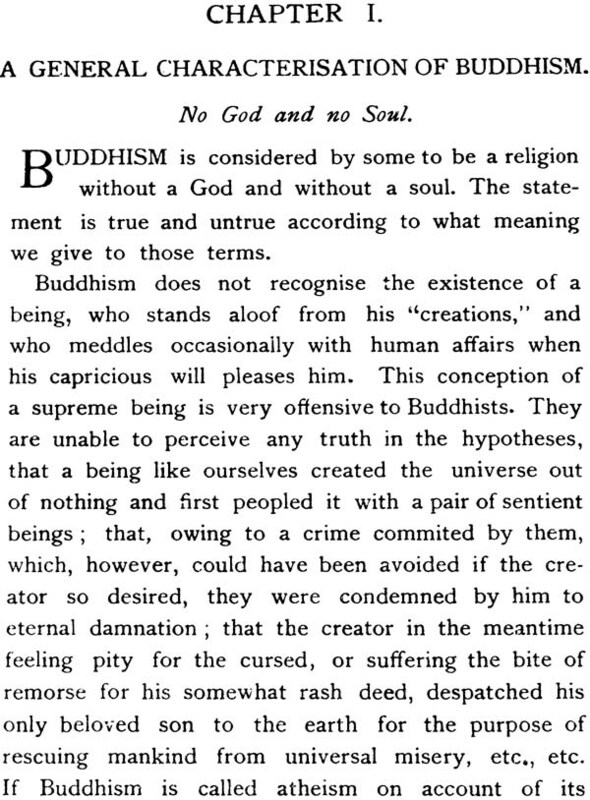 -Buddhism and Speculation. -Religion and Metaphysics. Three forms of Knowledge. -Illusion. -Relative Knowledge. - Absolute Knowledge. -World-Views founded on the three Forms of Knowledge. - Transcendental Truth and Relative Understanding. Indefinability. -The "Thundrous Silence." - Suchness Conditioned - Questions Defying Solution. -The Theory of Ignorance. - Dualism and Moral Evil. The Garbha and Ignorance. 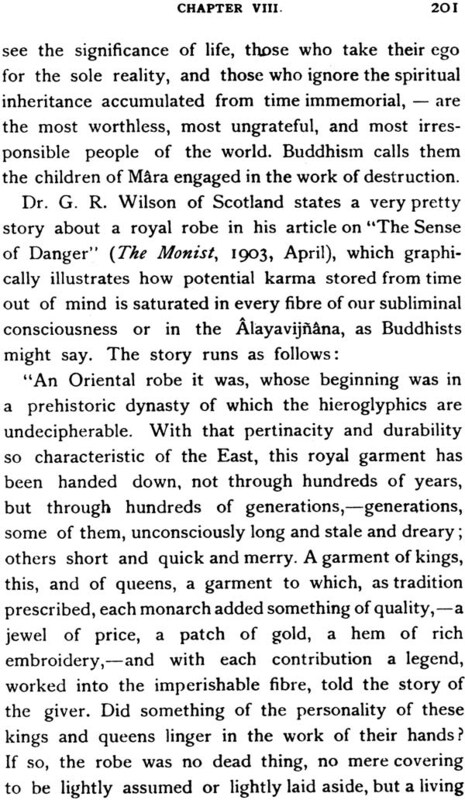 -The Alaya-vijnana and its Evolution. -The Manas. -The Samkhya Philosophy and Mahayanism. Atman. - Buddha's First Line of Inquiry. -The Skandha. - King Milinda and Nagasena. -Ananda's Attempts to Locate the Soul. -Atman and the "Old Man".- The Vedantic Conception. -Nagarjuna on the Soul. -Non-atman-ness of Things. -Svabhava. -The Real Significance of Emptiness. Definition. -The Working of Karma. -Karma and Social injustice. 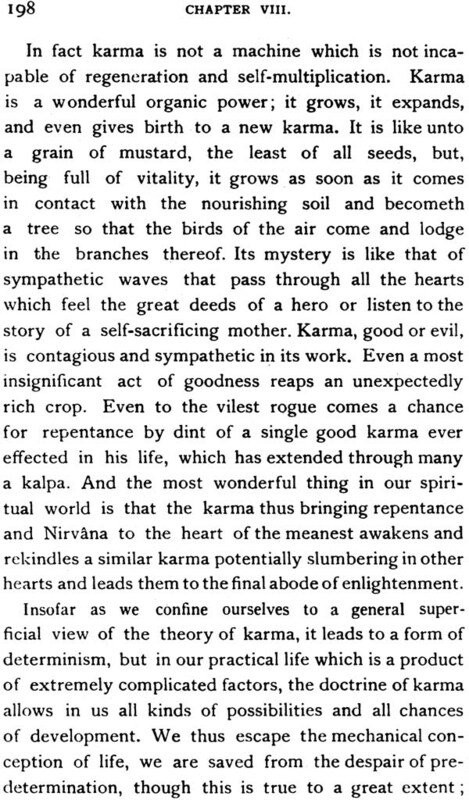 -An Individualistic View of Karma. 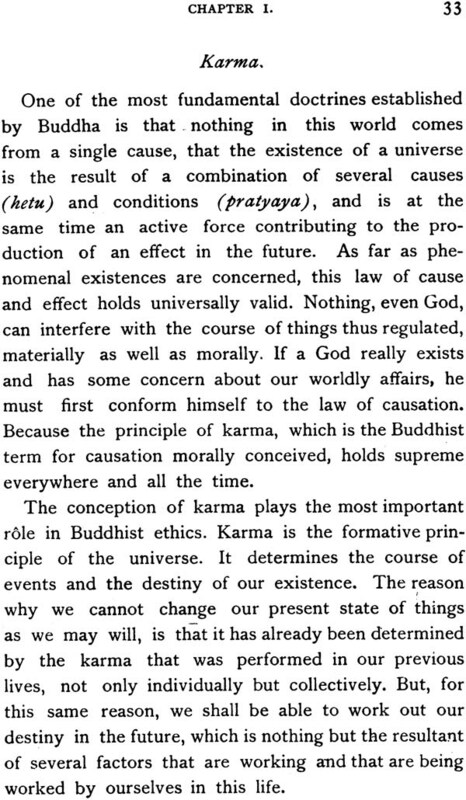 -Karma and Determinism. -the Maturing of Good Stock and the Accumulation of Good Merits. -Immortality. God. -Dharmakaya. -Dharmakaya as Religious Object. -More Detailed Characterisation. -The Dharmakaya and Individual Beings. -The Dharmakaya as Love. 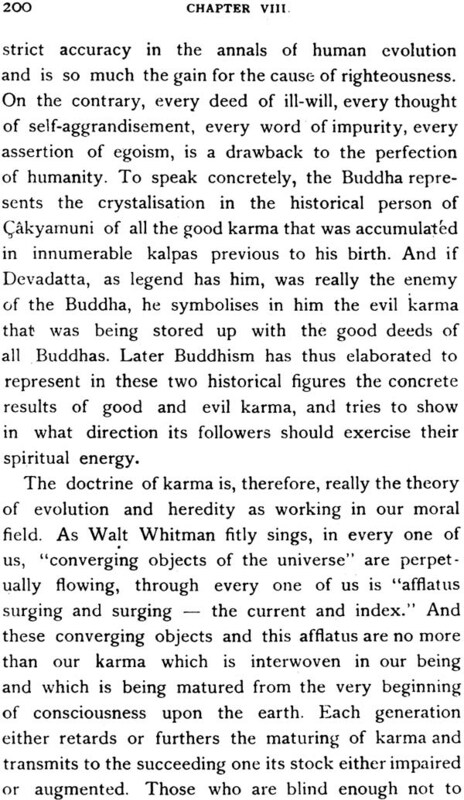 -Later Mahayanists View of the Dharmakaya. -The Freedom of the Dharmakaya. -The Will of the Dharmakaya. The Human and the Super-human Buddha. -An Historical View. -Who was Buddha? -The Trikaya as Explained in the Suvarna-prabha. -Revelation in All Stages of Culture. -The Sambhogakaya. -A Mere Subjective Existence. -Attitude of Modern Mahayanists. -Recapitulation. The Three Yanas. -Strict Individualism. -The Doctrine of Parivarta. 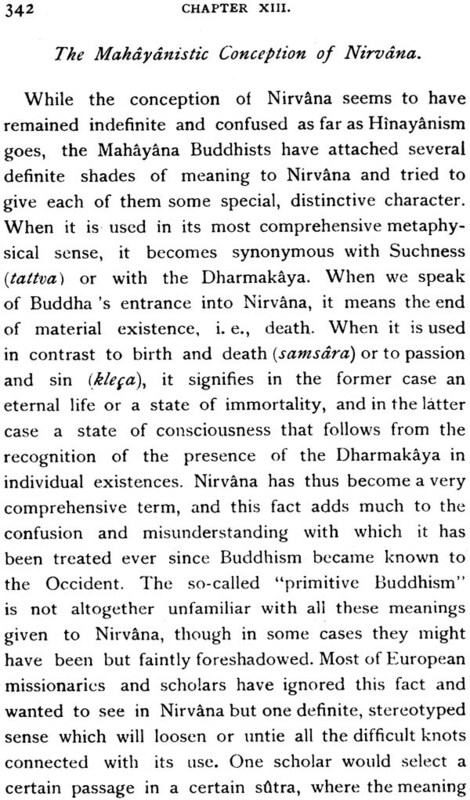 -Bodhisattva in "Primitive" Buddhism. -We are all Bodhisattvas and Love. -The Buddha's Life. -The Bodhisattva and Love. -The Meaning of Bodhi and Bodhicitta. -Love and Karuna. 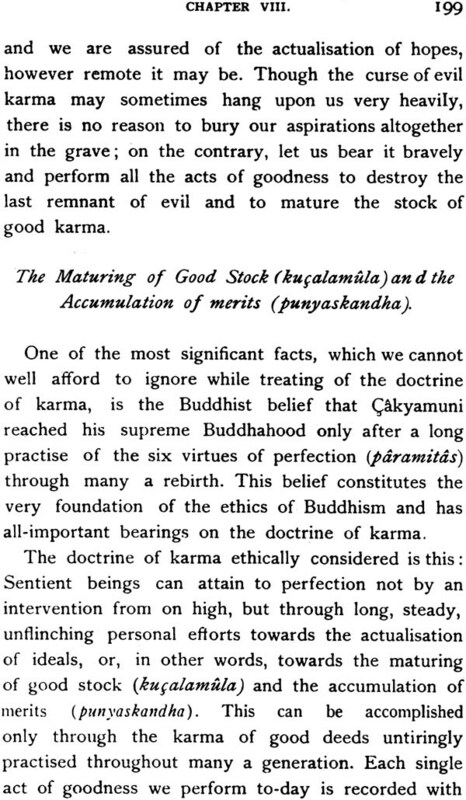 -Nagarjuna and Sthiramati on Bodhicitta. -The Awakening of the Bodhicitta. -The Awakening of the Bodhicitta. -The Bodhisattva's Pranidhana. Gradation in our Spiritual life. -Pramudita. -Vimala. -Prabhakari. -Arcismati. -Sudurjana. -Bhimukhi. -Durangama. -Acala. -Sadhumati. -Dharmamegha. Nihilistic Nirvana not the First Object. -Nirvana is Positive. 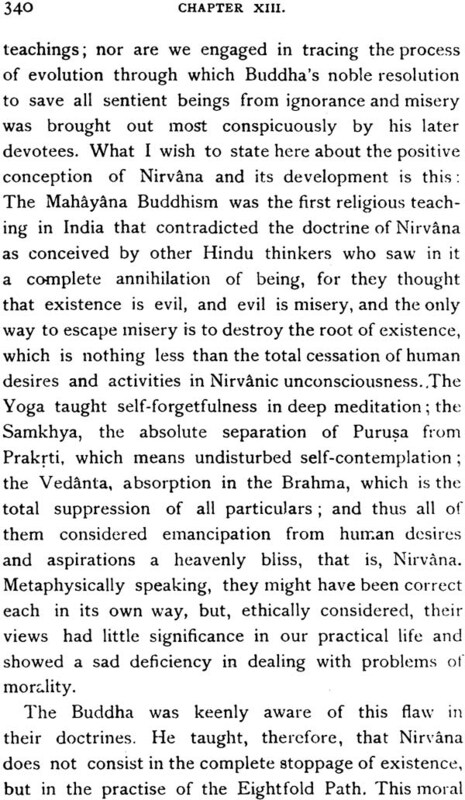 -The Mahayanistic Conception of Nirvana. 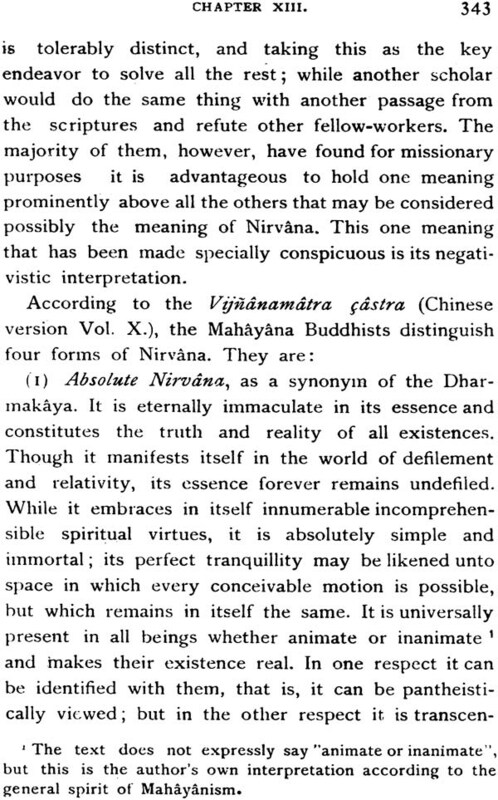 -Nirvana as the Dharmakaya. -Nirvana in its Fourth Sense. -Nirvana and Samsara are One. The Middle Course. -How to Realise Nirvana. -Love Awakens Intelligence. -Conclusion.